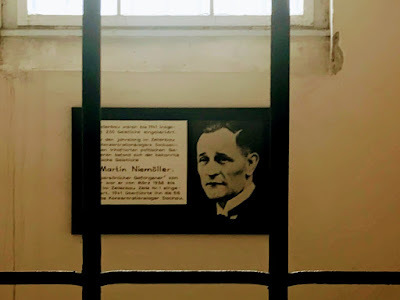 A moving moment during my visit to the concentration camp in Sachsenhausen, north of Berlin, last week was my visit to the cell where the Lutheran pastor and theologian Martin Niemöller (1892-1984) was held in isolation. It is sometimes said that the German theologian Dietrich Bonhoeffer (1906-1945) was hanged at Sachsenhausen Concentration Camp, but he was executed in Flossenburg, near the Bavarian border with Czechoslovakia, on 9 April 1945. 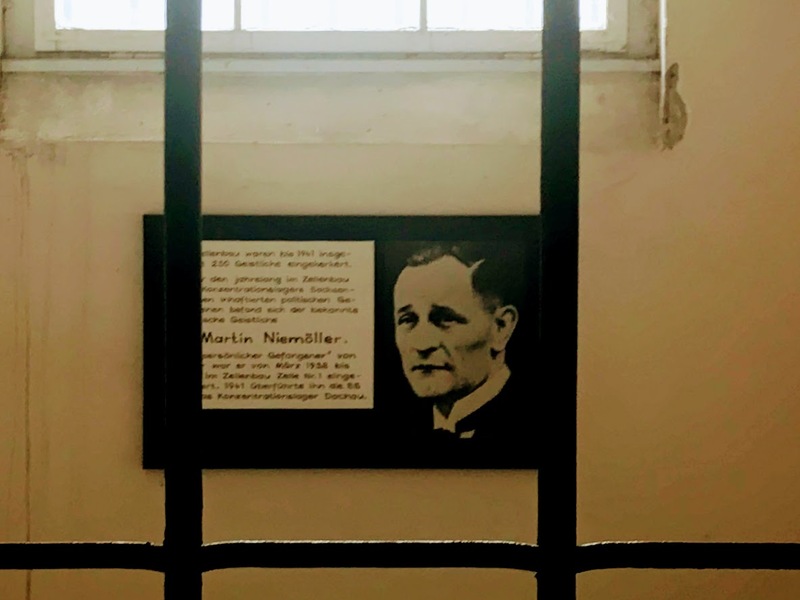 The prisoners held in isolation in Sachsenhausen included Martin Niemöller (1892-1984) and Bonhoeffer’s brother-in-law Hans von Dohnányi (1902-1945), who is now remembered in the name of the street leading from the centre of Oranienburg into Sachsenhausen. Between 30,000 and 70,000 prisoners died in Sachsenhausen from exhaustion, disease, malnutrition, pneumonia, and the poor living conditions. Many were executed or died in brutal medical experimentation, and many Russian prisoners of war were executed. Friedrich Gustav Emil Martin Niemöller (1892-1984) was a German theologian and Lutheran pastor. At an early stage he was a conservative and initially supported Hitler. But he became one of the founders of the Confessing Church, which opposed the Nazification of the German Protestant churches. He vehemently opposed the Nazis’ Aryan Paragraph, but he made remarks about Jews that some scholars regard as antisemitic. Martin Niemöller was born in Lippstadt, then in the Prussian Province of Westphalia (now in North Rhine-Westphalia), on 14 January 1892, a son of Heinrich Niemöller, a Lutheran pastor and his wife Pauline (Müller), and grew up in a very conservative household. In 1900, the family moved to Elberfeld where he finished school. During World War I, he was an officer in the German Imperial Navy. In 1915, he was assigned to U-boats, fighting in the Mediterranean, on the Thessaloniki front, in the Strait of Otranto, planting mines at Port Said and attacking ships at Gibraltar and in the Bay of Biscay, Marseille and other places. Niemöller was decorated with the Iron Cross First Class, but at the end of World War I resigned his commission, rejecting the new democratic government after the abdication of Wilhelm II. In 1919, he married Else Bremer (1890-1961), and that year began working on a farm before studying theology at the Westphalian Wilhelms-University (1919-1923). He was ordained on 29 June 1924, and worked first as a curate in Münster's Church of the Redeemer, and then superintendent of the Inner Mission in Westphalia, and a pastor in Dahlem, an affluent suburb in Berlin. In 1933, Niemöller founded the Pfarrernotbund, an organisation of pastors to ‘combat rising discrimination against Christians of Jewish background.’ By the autumn of 1934, Niemöller joined other Lutheran and Protestant church leaders, including Karl Barth and Dietrich Bonhoeffer, in founding the Confessing Church, which opposed the Nazification of the German Protestant churches. However, Niemöller only gradually abandoned his Nazi sympathies and even made pejorative remarks about Jews of faith while protecting – in his own church – baptised Christians, persecuted as Jews by the Nazis, due to their or their Jewish descent. In 1936, he signed a petition by a group of Protestant church figures who sharply criticised Nazi policies and declared the ‘Aryan Paragraph’ incompatible with the Christian virtue of charity. The Nazi regime reacted with mass arrests and charges against almost 800 pastors and church lawyers. Niemöller was arrested on 1 July 1937. On 2 March 1938, he was tried by a ‘Special Court’ for activities against the State. He was fined 2,000 Reichmarks and jailed for seven months imprisonment. He was released after sentencing, but was immediately rearrested by the Gestapo and was interned in Sachsenhausen and Dachau for ‘protective custody’ from 1938 to 1945. He narrowly escaped execution, and in April 1945, Niemöller and 140 other high-ranking prisoners were sent to the Alpenfestung, possibly to be used as hostages in surrender negotiations. The SS guards had orders to kill everyone if liberation by the advancing Western Allies became imminent. The entire group was eventually liberated by US troops. Niemöller never denied his own guilt in the time of the Nazi regime, and for the rest of his life he expressed deep regret that he had not done enough to help the victims of the Nazis. In 1959, he said his eight-year imprisonment by the Nazis became the turning point in his life, after which he viewed things differently. Niemöller was president of the Protestant Church in Hesse and Nassau from 1947 to 1961. He was one of the initiators of the Stuttgart Declaration of Guilt, signed by leading figures in the German Protestant churches, who acknowledged that the churches had not done enough to resist the Nazis. Niemöller’s own account of his popular, poetic quotation changed many times between 1946 and 1979. In prose versions, he named different groups on different occasions. In speeches, the middle groups often varied, but he always began with the Communists and ended with me. He always included the Jews, and usually named Social Democrats and or trade unionists. Sometimes, he also included disabled people, whom he called’'the sick, so-called incurables’ (Kranke, sogenannte Unheilbare). At other times, he quoted the Nazi term, ‘lives unworthy of life,’ referred to ‘occupied countries,’ or named Jehovah's Witnesses (ernste Bibelforscher) or Catholics. This version is inaccurate because Niemöller frequently used the word ‘communists’ and not ‘socialists.’ The substitution of ‘socialists’ for ‘communists’ is an effect of anti-communism in the US, and most ubiquitous in the version that has proliferated in the US. After meeting Otto Hahn, the ‘father of nuclear chemistry,’ in 1954, Niemöller became an ardent pacifist and campaigner for nuclear disarmament. He became a leading figure in the post-war German peace movement and was charged in 1959 when he spoke critically about the military. His visit to North Vietnam and Ho Chi Minh at the height of the Vietnam War was controversial. He became president of the World Council of Churches in 1961, and was awarded the Lenin Peace Prize in 1966. He built a small chapel at Dachau that was turned into a museum by the German government. He would greet visitors and discuss his time in the camp as well as hand out copies of his poem. He emphasised that his time in the camp was less important than the lesson he learned in the poem and urged visitors to always speak out for their brothers and sisters. Martin Niemöller died at Wiesbaden in West Germany on 6 March 1984, at the age of 92. In my sermons in Askeaton and Tarbert yesterday [16 September 2018], I related the theme of Wisdom (Σοφία, Sophia) in the lectionary readings with the name of Sophienkirche, the church off Große Hamburgerstraße, close to where I was staying in Berlin last week. Sophienkirche is also close to the old Jewish cemetery in Berlin, Sophienkirche is the first parish church built in the newly-developed Spandauer Vorstadt area in the early 18th century, the original centre of Berlin’s Jewish cultural and commercial life. It was at this church on Friday that I heard the story of Father Bernhard Lichtenberg (1875-1943), who died on his way to Dachau, a victim of the Nazis because of his life-long commitment to helping and aided persecuted Jews in Germany in the 1930s and 1940s. A picturesque gate and a narrow passageway lead up to Sophienkirche, the only surviving baroque church in Berlin. It and was designed by the Prussian court architect Philipp Gerlach (1679-1748). He designed three squares in Berlin, including Paris Platz, by the Brandenburg Gate at the end of Unter den Linden, but Sophienkirche is one his few surviving churches. The foundation stone of the church was laid in 1712 by Frederick I of Prussia (1657-1713), who intended the church should be named Saint Sophia’s Church in honour of his third wife, Sophie Louise von Mecklenburg-Schwerin (1685-1735). However, Fredrick I died on 25 February 1713, and his wishes were not carried out when the church was consecrated at a ceremony presided over by Frederick’s son and successor, Frederick William I of Prussia (1688-1740). Instead, four months later, on 18 June 1713, the church was dedicated as the Spandauische Kirche. 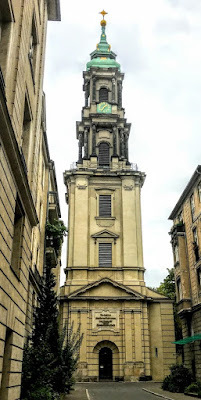 So, why did Frederick William I not carry out his father’s wishes and see that the church was dedicated to Saint Sophia in honour of his step-mother, Sophie Louise? Frederick I was married three times, and his widow, Sophie Louise von Mecklenburg-Schwerin, was his third wife. She was a pious Lutheran and was almost 30 years younger than her husband. He had only one son, Frederick William, and he married her in an arranged marriage in 1708, when he was twice her age – she was 23 and he was 51 – to ensure the Hohenzollern dynastic succession. However, Sophie, had no children. Her Lutheran confessor, the young hymnwriter Johann Porst (1688-1728), introduced her to the Pietist August Hermann Francke (1663-1727). Under his guidance, the queen grew more serious and stricter in her manner, spending her time increasingly in a routine of prayers and sermons. It was said her court was like a convent, and she tried to convert Frederick from Calvinism to Lutheranism. The king responded by admonishing Porst and exiling Francke. From then on, he seldom visited her in her apartments, she withdrew from court life and lived in retirement in her rooms. There she became obsessed with religion, and fell into states of depression and derangement. She periodically lost her ability to control herself and her courtiers tried to conceal her violent fits from the king. During the last long illness of the king, which eventually led to his death, one particular incident awakened the king to the queen’s mental state. One night, dressed only in her white nightclothes and with loose hair, she rushed through the gallery that connected her apartments with those of the king, burst through the glass door into his room and, covered in blood from the wounds caused by the broken glass door, she attacked the king and screamed abuses at him. The king was in a fever and awoke suddenly. In his confusion, he imagined she was the legendary ‘White Lady’ who would foretell his death. His screams brought his attendants to his bedside, and Sophia Louise was removed, unaware of what she had done. In January 1713, just a few weeks before his death, Frederick sent her back to her family in Mecklenburg-Schwerin. Sophia Louise was said to be ‘helpless, mindless, and melancholy.’ From then on, she lived with her widowed mother at Grabow castle. When Frederick William presided at the consecration of the new church on 18 June 1713, it is understandable that he did not want to carry out his father’s wishes when it came to naming the church, perhaps blaming his stepmother Sophia Louise for hastening his father’s death. Johann Friedrich Grael (1707-1740) added the baroque tower to the church in 1732-1734, and when Sophia Louise died in 1735, she was buried not in the Hohenzollern crypt in the Berliner Dom but in the Schelfkirche Saint Nikolai in Schwerin. Frederick William I died in 1740, and eventually his son, Frederick II (1712-1786), remembered today as Frederick the Great, decided to revive his grandfather’s original wishes, and had the church renamed in honour of Sophie Louise. Ever since, the church has been known as the Sophienkirche. The church was rebuilt to designs by the architect Friedrich Schulze (1843-1912) in 1891-1892, when it was given a much-needed facelift. The roof was raised, the chancel was added at the east end, altars were added, and many other changes were introduced, enhancing the aesthetic integrity of the church. The surviving interior decoration is almost entirely from this restoration. Two 18th-century German poets are commemorated on the walls of the church. There is a memorial to the poet Karl Wilhelm Ramler (1725-1798) on the outside wall of the church sacristy and another on the outside north wall to the poet Anna Louisa Karsch (1722-1791), known to her contemporaries as ‘Die Karschin’ and ‘the German Sappho,’ and the first German woman to live from the proceeds of her own literary works. In the cemetery beside the church, Friedhof II der Sophiengemeinde, the notable burials include the composer Carl Friedrich Zelter (1758-1832), founder of the Sing-Akademie zu Berlin. Here too are graves from the last days of World War II, when street battles were fought nearby in Sophienstraße. At the height of the Cold War, when the Revd Dr Martin Luther King visited Berlin in 1964 at the invitation of Willy Brandt, he decided to make an unscheduled visit to East Berlin, crossing at ‘Checkpoint Charlie’ and visiting the Humboldt University, the Marienkirche and the Sophienkirche on 13 September 1964. It is worth telling that Martin Luther King was born Michael King. His father had visited Germany in 1934 to attend the Fifth Baptist World Alliance Congress. Despite the Nazis, he was so impressed by Germany and by Martin Luther that he eventually changed his own name and his son’s name to Martin Luther King, although his son’s birth certificate was not legally amended until 1957 – seven years before he visited the Sophienkirche; he would receive the Nobel Peace Prize a month after that visit to East Berlin.